If you are thinking about selling your house, you are probably also thinking about ways to maximize your net at closing. When you look around your home, you know should make a few updates but are unsure whether the cost of improvements will actually result in more money in your pocket at closing. Here are the 4 top home improvements recommended by HGTV to net you the most return on your investment. Exterior painting and refreshed landscaping will help get more buyers to come see the inside of your home and updated kitchens and baths are two of the most important rooms to buyers when considering which home to buy. 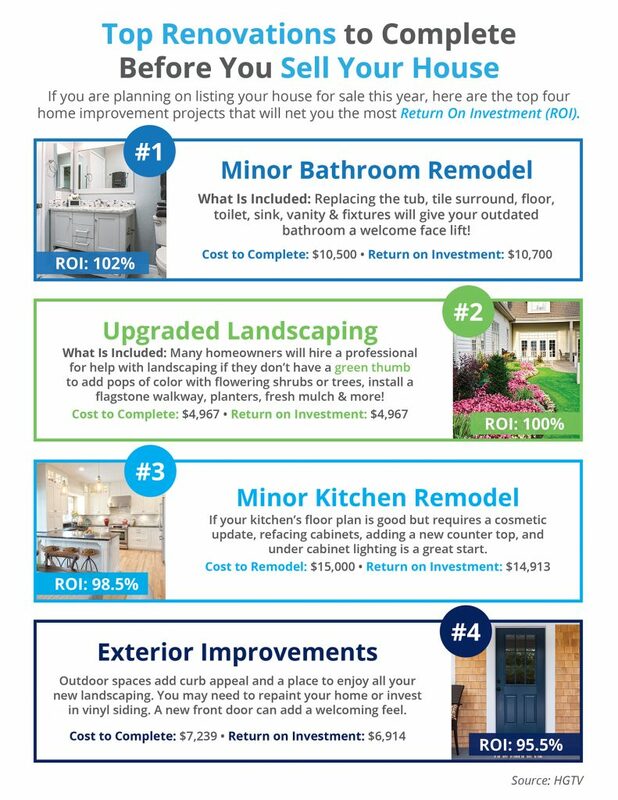 You may have noticed that only one of the above listed improvements will bring you more return on your investment (102% for Minor Bathroom Remodel). The truth is most home improvements won’t bring you more than you spend, however in most cases they will cause your home to sell much more quickly and for top dollar. For more information on cost verses value of completed renovations check out Cost vs. Value for national and regional statistics -> here.